It’s my true ride-or-die grocery store! And it’s not just any grocery store — it’s one that actually feeds and nourishes you with the utmost integrity. I can’t actually get through the day without it….. why???? It’s true that the fine folks at Jack’s know my order when I walk in. Everyday my organic coffee with extra foamy whole milk only is my happy ritual! If you need to stock your summer fridge for an on-the-go breakfast option, stop by our TA studios in Water Mill or East Hampton for our organic TA Clear Bars. They make great kid camp snacks too! Amagansett Square, 6 Main Street, Amagansett, NY 11930My son used to beg me to drive from Sag to Amagansett during the school year just to bring him Hampton Chutney for lunch! There aren’t quite the lines in the dead of winter and boy do we get spoiled that they stay open year-round because I would wait in a 3 hour line for my favorite Uttapam. I’m into places that the kids can roam and enjoy while the adults do too. Obviously we are all so blessed and perhaps admittedly spoiled to have this summers EMP seasonal guest appearance in East Hampton. Penny enjoys dancing on the open stage fielding missed ping pong shots, while we await the most insane lunch you will ever eat. Willing to make the drive from Sag to Montauk to go to Crows Nest where the kids can roly poly down the hill while we dine. When my dear friend, interior designer and Third Way co-founder Victoria Stokes, shows up to a dinner party she brings this dreamy “by special request only” pie (because I think she actually forced Grandma Ruth to create it for me) and I LOVE it — and all of her incredible pies. I say drip me in Roxanne Assoulin, I love her entire collection. It makes me feel hippy dippy happy! So the gold Jennifer Fisher hoops have become the Rachel Haircut for the ears. They are iconic to say the least. I love that two of my favorite shops (for two very different purposes) are right next to each other in East Hampton. Ladies, whether you are 15 or over the age of 50 don’t let this store scare you. When I go in and ask for my favorite stylist there, Ava Lantiere (@avalantiere) she already knows not to give me mini skirts and half tops — but she will still find me legit fashion fun trendy pieces that make even going to the gym, way cool. What more can I say: founder of Kirna Zabete, Beth Buccini is a class act through and through. I love her as a woman and I am obsessed with everything in her store. I’m obsessed with her store, period. And her incredible presence. Where the cool kids who are serious about having healthy joints when they are 80 hang out and where you can also shop in our tent featuring cool trunk shows from fitness brands I love all summer at my Water Mill studio. I basically shop off of my friend Candice Miller (@mamaandtata) as she comes to class, a dinner party, or event. She has helped set the fashionable stage for this cool store. Serena and Lily has a really well thought out selection of fun gifts to take to a dinner party. I recently snagged the cutest sand castle making kit and super styling throws to take to a BBQ for a special host’s kiddos. My travel expert beautiful friend Mia Ljungberg Nevado introduced me to the LongHouse Reserve in East Hampton. Please take her advice and don’t miss this special place. Here is my dear BFF and Interior Monologue founder Tanya Zaben (@interior.monologue) getting real with me on my Sirius XM radio show you can catch on your summer Mondays at noon on channel 109. Grab your paddle boards and make your pledge pages ladies and gentlemen for the annual Hamptons Paddle and Party for Pink. If you ask me, this is the Hamptons event not to miss! Let’s help the Baum family and the BCRF find a cure for breast cancer! I thought I would send out a holiday gift guide. 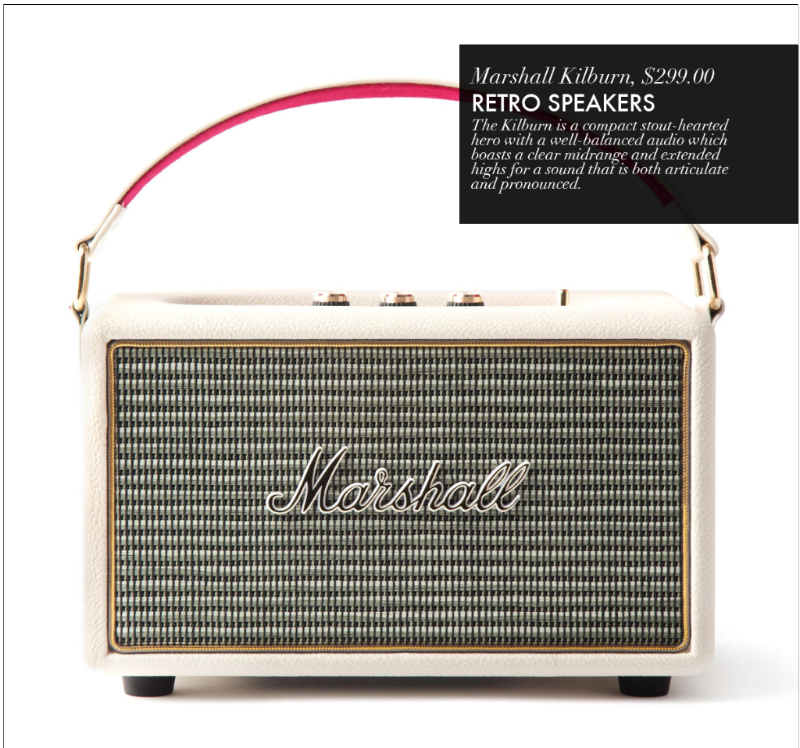 But then I thought about it further and realized that I’m so sick of holiday gift guides. And I don’t think any of us really need any actual gifts this holiday season. We especially don’t need any more clothing. We all have too many clothes. We need to get hyped to make the world a better place. 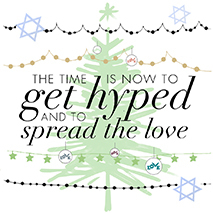 The best way to get hyped is to spread positivity through love and warmth. Nothing radiates positivity more than—you guessed it— a smile. 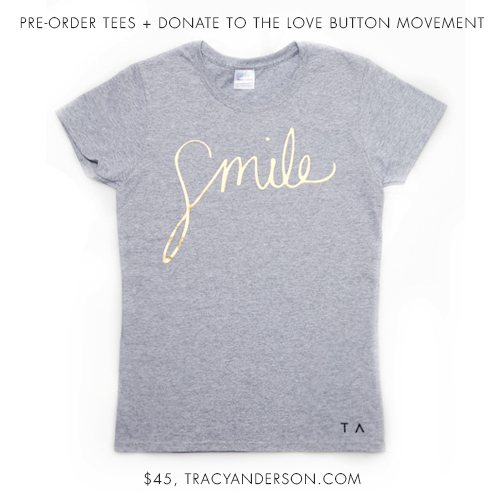 The proceeds from these three simple-yet-powerful T-shirts will go to the Love Button Global Movement, which brings people together through simple loving acts of kindness. In addition to buying and wearing these T-shirts, I hope that you’ll consider making additional donations to Love Button. Or consider packaging your gifts with loads of actual “Love” buttons. A bucket of love buttons has the power to make people smile and get hype. Even though I told you I wasn’t going to send out a holiday gift guide, I’ve still laid out of a number of last minute gifts you can give with an email and a message. Maybe you even want to buy them for yourself. 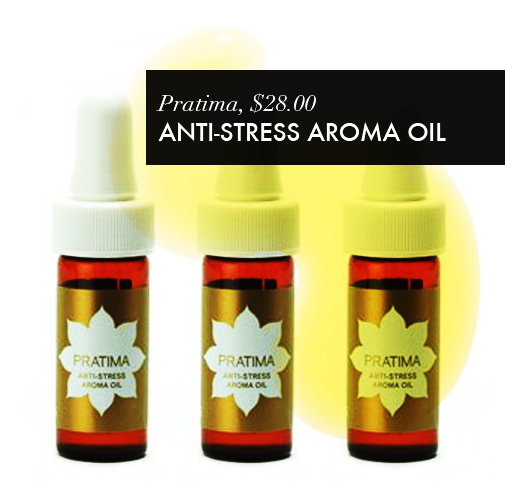 They’re gifts and experiences to improve your health and also help any Grinch heart grow three sizes in a day. 2017 should be the year we leave the “trend” mentality behind and start really understanding what it means to be healthy. 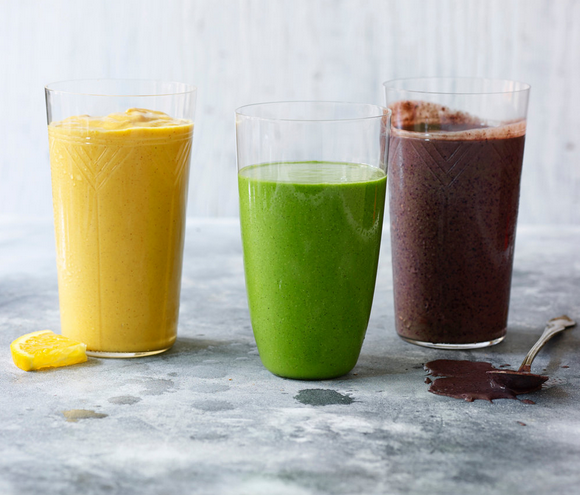 Healthy isn’t chasing a six-pack or a six-foot-long leg. It’s about jumpstarting and taking a stance on life. You can do that through my live-streaming TA Real Time system. Or through one of my two and four day retreats. Those are the kind of gifts that are more than just gifts. They’re about creating a bright and healthy shining light, for yourself and the people around you. 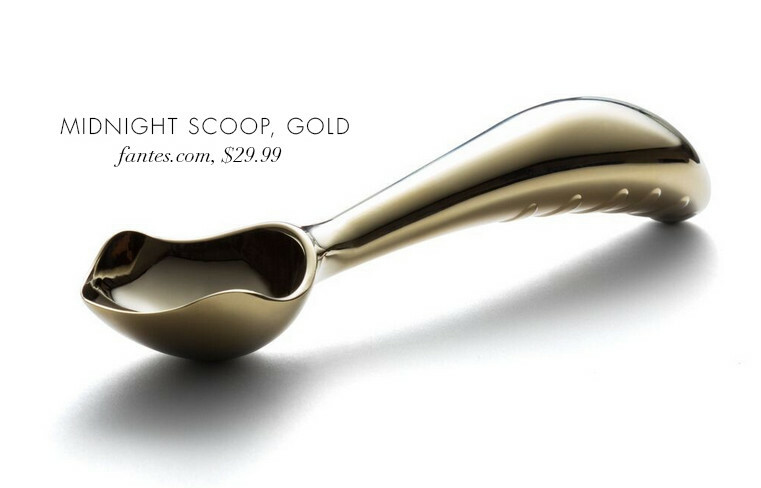 Or you can always get a gold ice cream scooper. Just because it makes me smile. And if there’s one thing that helps me get hype, it’s chocolate ice cream. I love getting gift certificates. 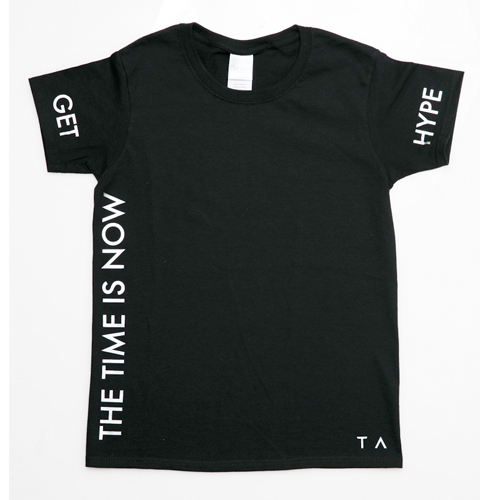 If you want to give someone the gift of choosing one of the new 9 TA leggings, 3 do some major good T-shirts, or make their entire year with a ViTAlity Week or a year of streaming I think it is kind of cool to let people chose what they want most. 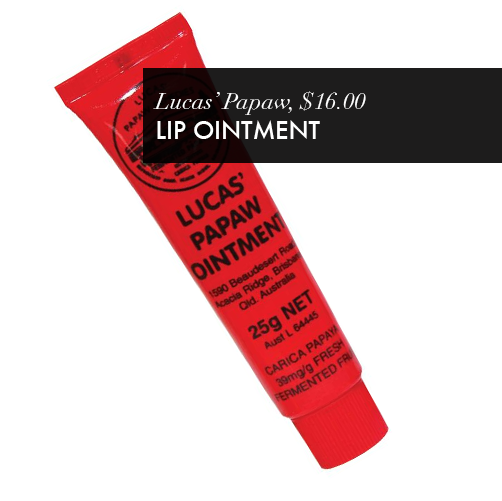 Your face cream doesn’t have to cost a fortune to be the safest and most effective. The Ecco Bella Day Cream ($47, eccobella.com) has changed my skin. I would easily call it the new miracle cream and who doesn’t want to get a miracle in a bottle as a gift. Penny yes my 4 year old Penny wears it and I wear it. That is how safe it is. 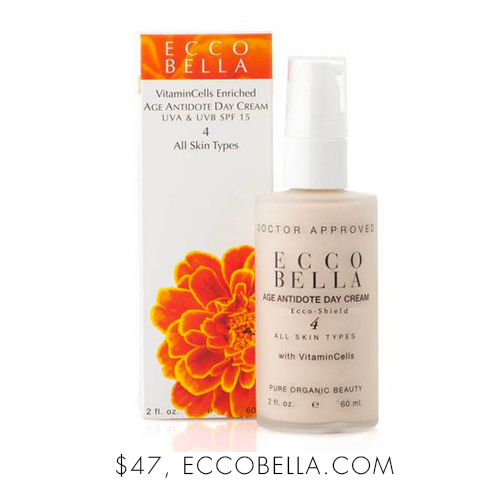 The Ecco Bella day cream is rich with DMAE an amino acid that has the effect of firming the skin. I have never received more compliments on my skin then I do now. I continue to love TAva more and more each day as I see all of the incredible dancers come to life in my clients. Especially the ones who didn’t believe they had a dancer within them. I always prefer to let time prove what focus can bring forward – and the results from TAva married with the muscular structure has proven to be a joint friendly, result driven, dancing dream. The best part is that even if you don’t have access to my Super G floor, your joints will still thank me for getting you dancing while saving their health. I am so excited to release the digital download of the TAva DVD. This is where you start. 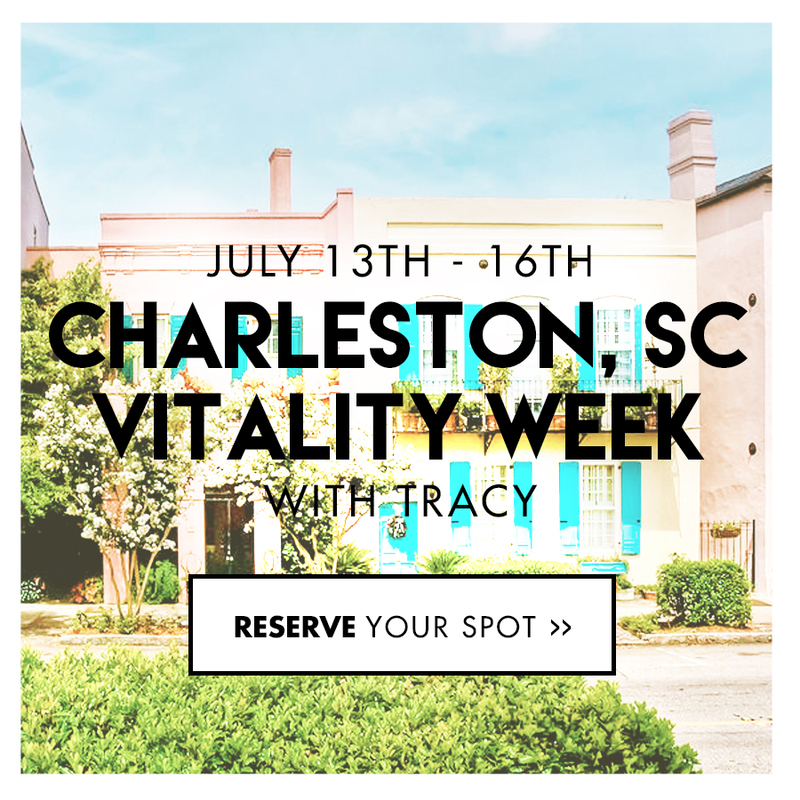 The idea of this program is for all of us to learn together as Tony and I craft level one of a workout that is here to stay. Once you master this TAva series, your brain will be ready to learn the TAva add-on dances that come as a free bonus with my TA Real Time streaming product. 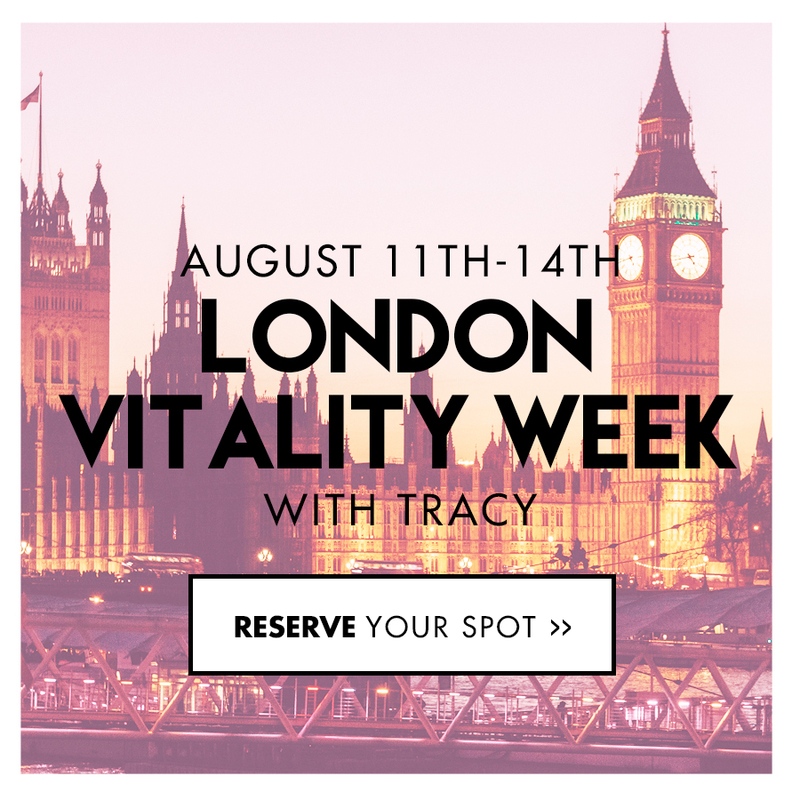 If you join our streaming community, you will receive my weekly master classes that take you on a strategic journey with me to your most balanced, beautiful body. 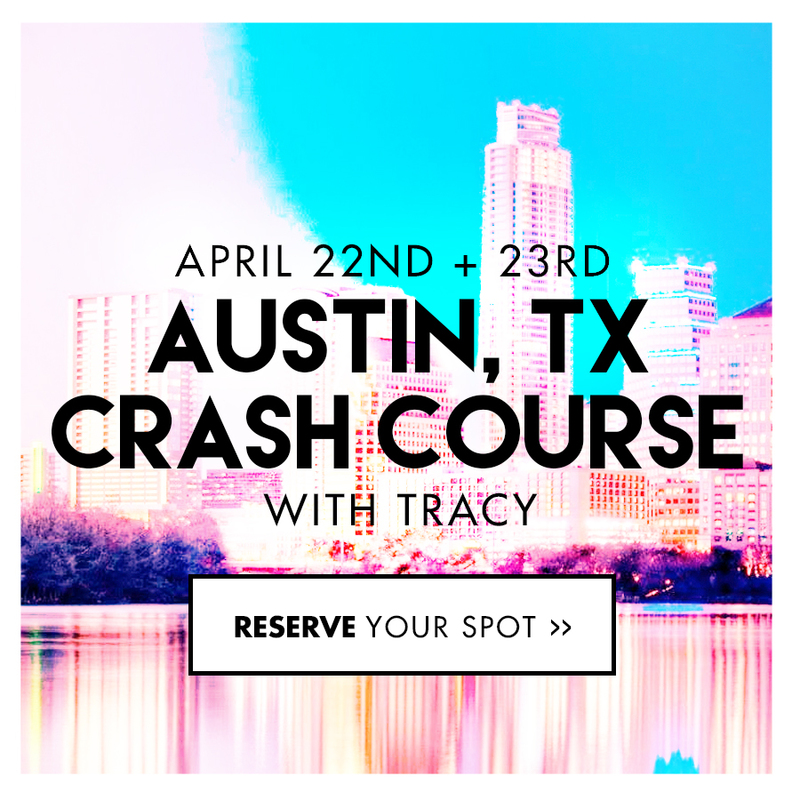 There is also a beginner master class program, a high-impact dance cardio series, and TAva DVD add-ons. 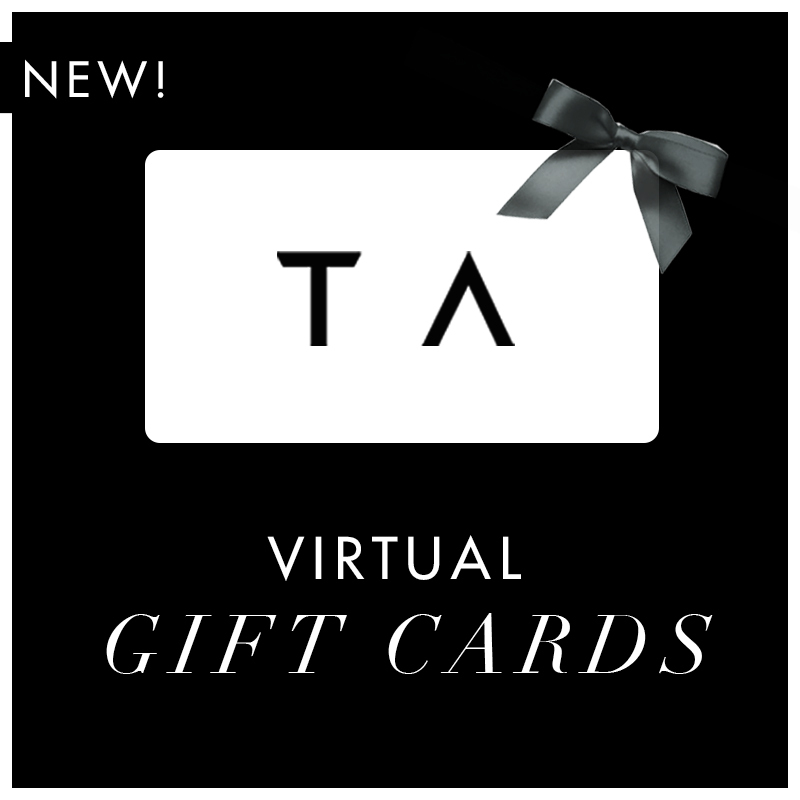 If you prefer using a physical DVD, then don’t miss out on picking up TAva at your local Target store or on my website at www.tracya.wpengine.com. This is only the beginning of a lifelong dancing journey! 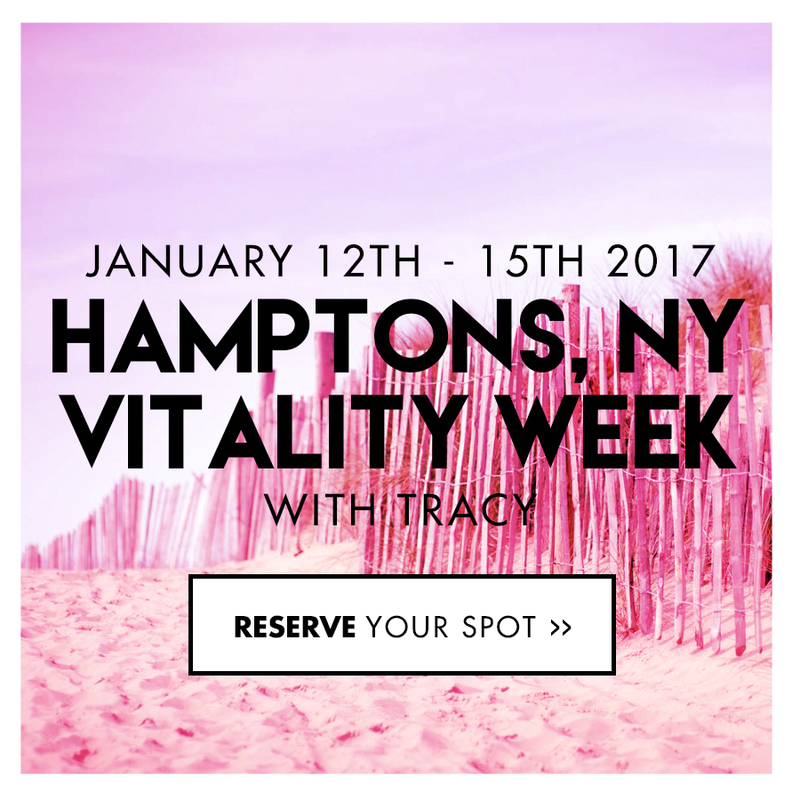 I am so excited to announce my dead of winter in winter Hamptons Vitality week. I decided to share one of my most magical friends with you to help better understand why this just might be the trip you don’t want to miss. 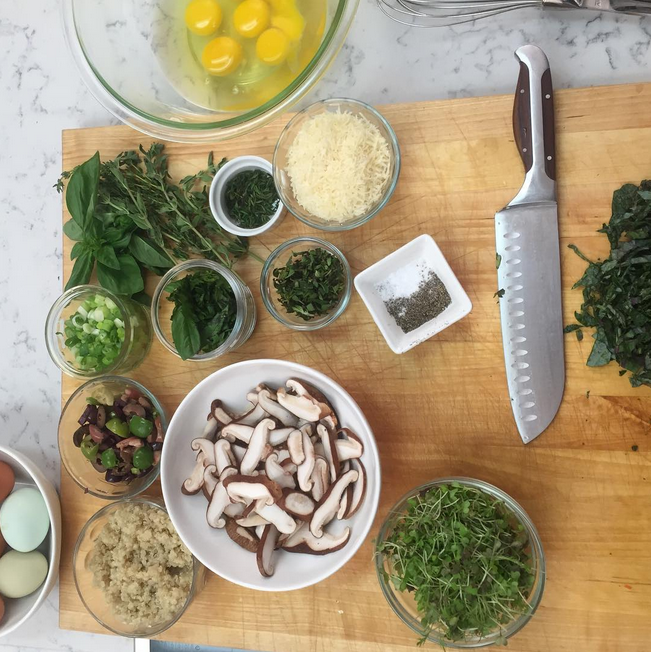 To entice you even more I am also going to be including my incredible chef Aura Winarick as an add on if you would like the best healthy food of your life to optimize your experience. And the brilliant Dr. Eric Bernstein with options of laser work for your skin that will reverse any summer or stress damage you may have ever done. This is a “not obvious” get away with the best of them. It is very easy to follow the crowd to the “seasonal” hot spots much like we find it easy to follow trends, or easy to do what someone very convincing tells us. I have found that as I have worked to find my voice out of respect for wanting to live up to the unique individual I am capable of being – following the crowd has become less and less appealing to me. I don’t want the “easy” way out. I don’t want the “model” life, and I don’t want to wear the “obvious” choice. I want to imagine a perspective that is painted by my rejection of banal utilitarianism and denatured commonality. A place where we are encouraged to challenge ourselves to experience the road less traveled in hopes that branching out will be the missing piece to the unity and understanding humanity so desperately needs. My dear friend Mia Ljungberg Nevado represents the elements the world is yearning for. A very delicate sensing, nurturing, brave woman that cares about her relation to the entire world at large. I have never met a woman as mindful as Mia. Mia has a persistent inquiry to reposition the idea of networking to a loving interwoven orchestra that brings everyone’s best light in a world forward. A network void of opportunism and instead where we can give for the win win. Her recommendations and intimate peek into her families lifestyle is to make everyone that is loving love closer and harder! To dodge the familiar warm beaches year round and jump into the chilled wind across your rosy cheeks as the waves crash In a winter wonderland fury. It is these meaningful and charged small adventures that expand your experience and allows for the appreciation of the warmth to come again. I am a firm believer in the need to awaken our senses. To awaken your senses and to live we can not always be comfortable. I believe we all need to embrace a life-world approach to everything we do. Mia has lived in and parented in many different countries. She gets involved and seeks and finds the quality experiences everywhere. She is uniquely positioned to help us expose our children to life on earth without a small lens. Mia has style, heart, and what I would call a high standard for living a beautiful life while your feet remain on the ground. The other night when we were having a drink I complemented her incredibly chic striped turtleneck, tailored shorts, tights and boots fully expecting them to be some house of “crazy expensive”. She flashed her gentle, dashing smile and replied, “it’s all Zara darling.” This is one of the things I love most about her. You don’t have to have an endless bank account to travel the world in style. It’s all about great tips from people that actually value being down to earth and value relating to one another. People always had a hard time understanding why I didn’t live in the city. For me I need the connection to nature that isn’t disrupted by the vibrations of the city. I do find it charming when I meet friends that have lived a faster paced life that chose to slow down refreshing to me. In following my gut and choosing to live more remote I have made some of my most meaningful friendships. While the summer hamptons season is charger I was in love with the off season so much I yearned for it. Whether or not you grew up in the seasonal Midwest like I did, I believe in searching out and experiencing the off season anywhere. It represents a journey that hasn’t been exhausted and a dynamic embodiment of sensory self love. To journey in the dead of winter to a proper representation of the dead of winter to get to know yourself better and connect with your body and health more couldn’t sound more ideal to me. I hope you find Mia’s interview and advice as cool as putting on Sinatra and a nightgown or white t-shirt and lighting a fire from the most important place to spark it… inside you and your inner journey to come. I have been reviewing hotels for more than 20 years. I started out as a honeymoon reporter and travelled the world reviewing the very best honeymoon suites. I have written for Conde Nast Traveller UK, Mr & Mrs Smith and several international inflight and luxury lifestyle magazines about the latest trends in traveling. I have been hiking in the Amazon, horseback riding in the Andes of Ecuador, exploring Galapagos with Charles Darwin´s family, snorkeling in the Maldives, gone fishing in the Seychelles, Balloon safari in Kenya, Danced under the stars in Ethiopia, gone flower picking in China, antique shopping in Burma and much more and I am always looking for the best insider tips to share with my readers. 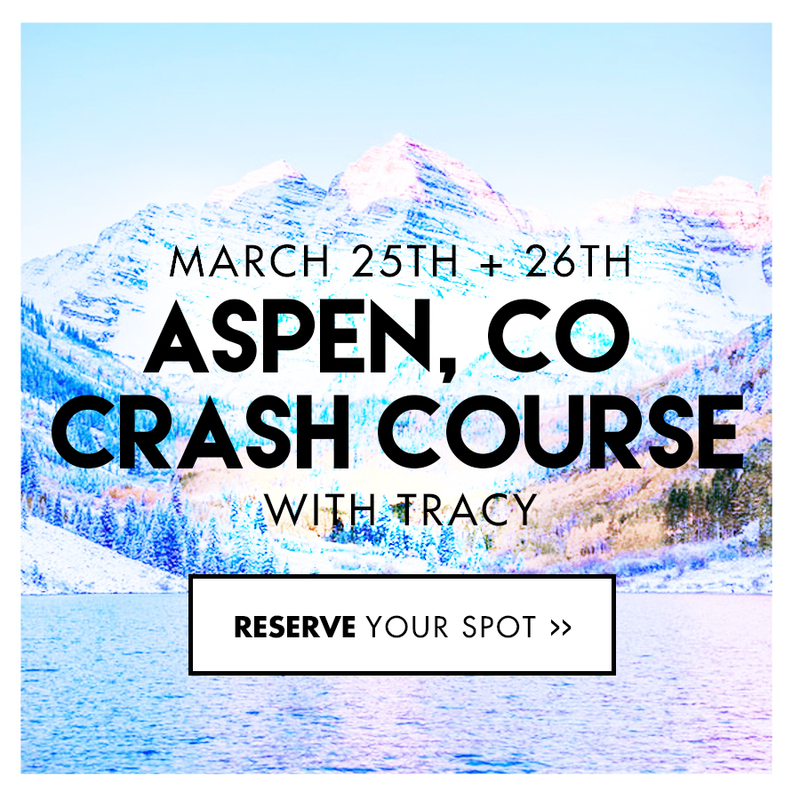 Since I became a mother I wanted to help other parents who love to travel in style to find the best places to take their children. I have been visiting and researching kids clubs and kids programs all over the world and there are some pretty amazing places to go. One of my favorite places is Soneva Fushi in the Maldives. A barefoot no news no shoes sustainable eco luxury resort where they educate children about the environment. The kids club, “The Den”, which is its own resort within the resort is one of the most outstanding and sophisticated kids clubs I have ever seen. Not only do they please the younger children but also older children whom can learn from their resident astronomer about the stars or spend a day on the sea with their resident marine biologist and learn about the ocean. It is a place where both parents and kids will unwind and recharge. I was born in Denmark, lived in Copenhagen, Denmark, Stockholm, Sweden and in Quito, Ecuador for many years before settling in the Hamptons where I live with my lovely husband and two sons. YOU HAVE LIVED ALL OVER THE WORLD AND HAVE TRAVELED THE WORLD AT LARGE WITH YOUR BEAUTIFUL FAMILY IN HEART FULL STYLE. WHAT WAS IT THAT DREW YOU TO THE HAMPTONS YEAR ROUND? I cannot image a more beautiful place to live. 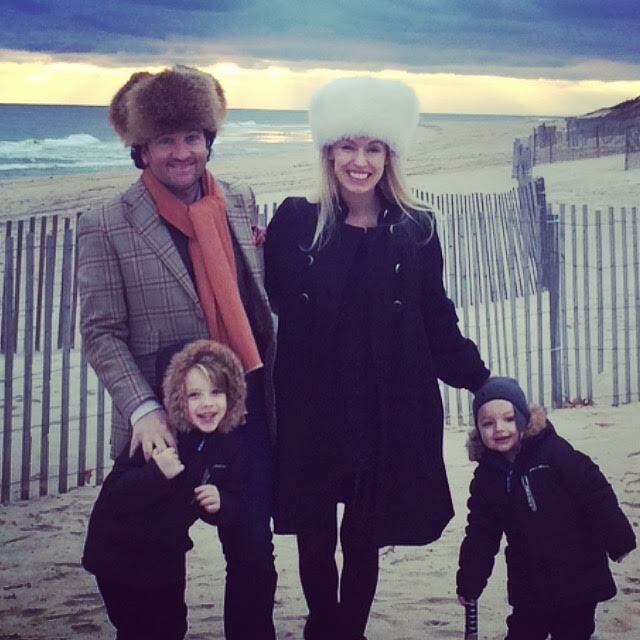 We had been visiting the Hamptons for years and fell in love with the nature and people who live out here and after some years in South America we decided to settle here because it is close enough to our favorite city New York but calm enough to live year-round as a family. We have some of the most beautiful beaches here, the air is clean, it is safe and it is quiet. We have amazing hotels, restaurants, shops and farmer markets that can stay open all year round because of all the lovely New Yorkers that come out here for weekends and holidays year round to help keep them busy. What other small towns in the world can offer such rich life with culture and class despite how few people live here year round. 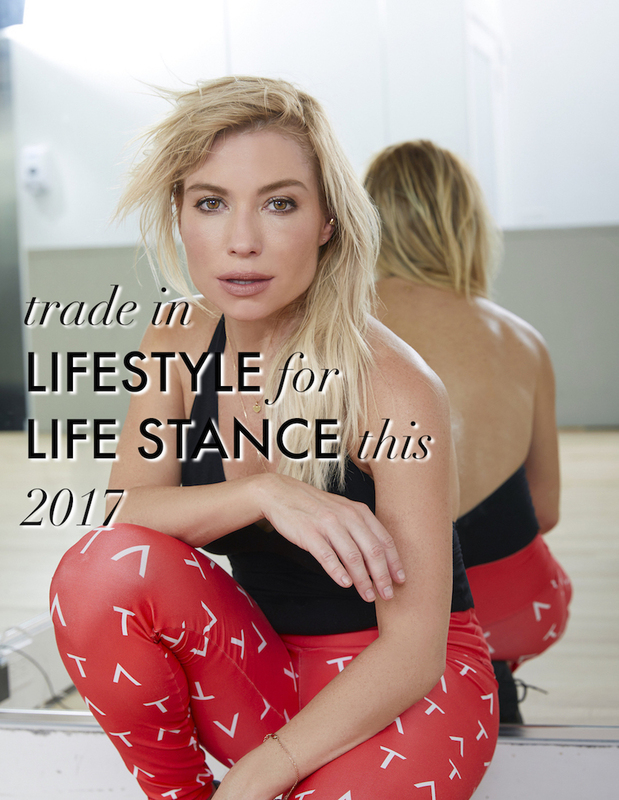 To have access to two Tracy Anderson Studios out here one in East Hampton and one in Water Mill is such a luxury for us who live here year round. Thank you! Since I moved here I have traveled less because every day here feels like a vacation to me. PLANNING A LAST MINUTE TRIP TO THE HAMPTONS DURING PEAK TIMES CAN PROVE TO BE VERY EXPENSIVE AND RIGHTFULLY SO AS IT IS A VERY PLACE TO SPEND YOUR SUMMER HOLIDAY. 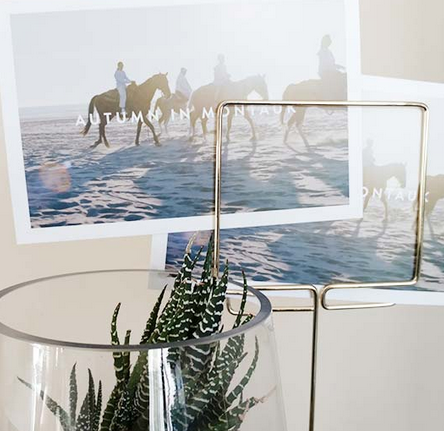 WHAT ARE YOUR FAVORITE PLACES TO STAY THAT ARE SURE TO MAKE ANY DAY OR ANY TIME OF YEAR FEEL LIKE A HOLIDAY IN THE HAMPTONS? You are so right, often friends are surprised when they discover how expensive it is out here even off season. I always tell them too see it as a total experience – The nature, the beaches, the silence – a rare luxury these days and that is worth every penny. To come out here and walk on the beach on a sunny day in the autumn, in snow during winter or an early spring day can be such a magical experience. 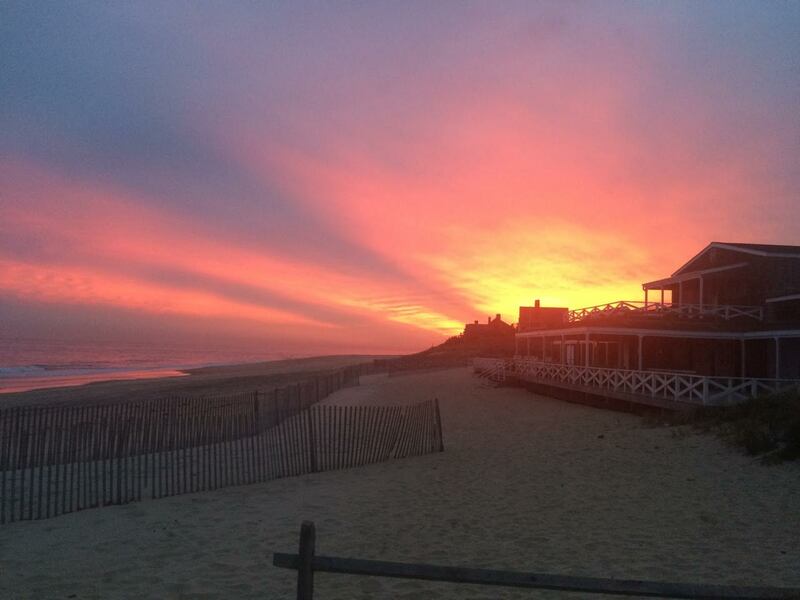 Some of my all year round favorite places to stay are Gurney´s Resort in Montauk. It is one of the very few hotels out here that is actually located on the beach and they have a lovely sun-deck where you can sip a cold drink in the summer or a hot chocolate in the winter while listening to the waves. I also love the Ram´s Head Inn on Shelter Island, it is a small family-owned hotel that brings you back in time. It is cozy and the restaurant is lovely and there is a wonderful garden where children can play safely and you have stunning views of the ocean. 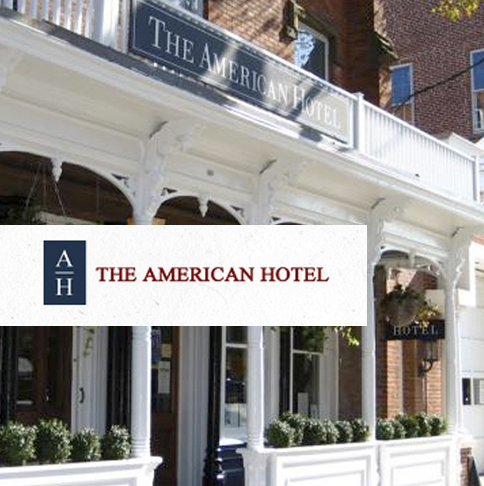 I love The American Hotel in Sag Harbor, such cozy atmosphere and a place that brings the locals together whether it is on a warm summer eve or cold winter night. You can go there in the afternoon, play chess and enjoy a hot chocolate by the fireplace. 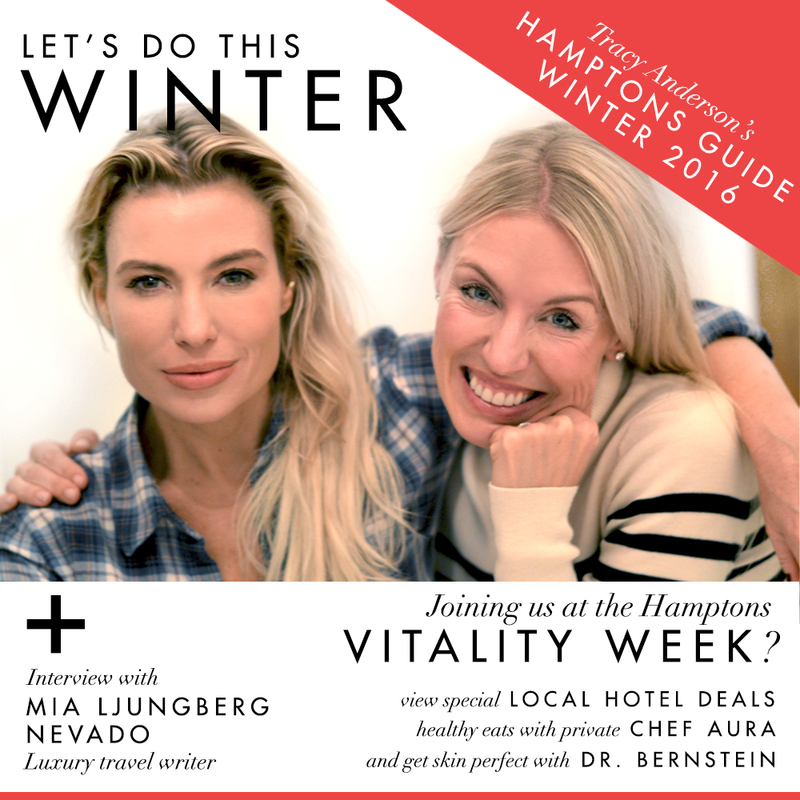 WHAT ARE THE KEYS TO ENJOYING THE FALL, WINTER AND SPRING MONTHS IN THE HAMPTONS? I KNOW I LOVE THE WINTER BEACH IN MY SNOW SUIT! IT TRULY IS QUITE A SPECIAL FEELING. I agree with you, a snow covered beach on a winter day in the right clothing is very special. I love beach picnics all year round and a hot chocolate on the beach on a snow day is very nice. The key is really to enjoy the amazing nature and culture that the Hamptons has to offer year round. 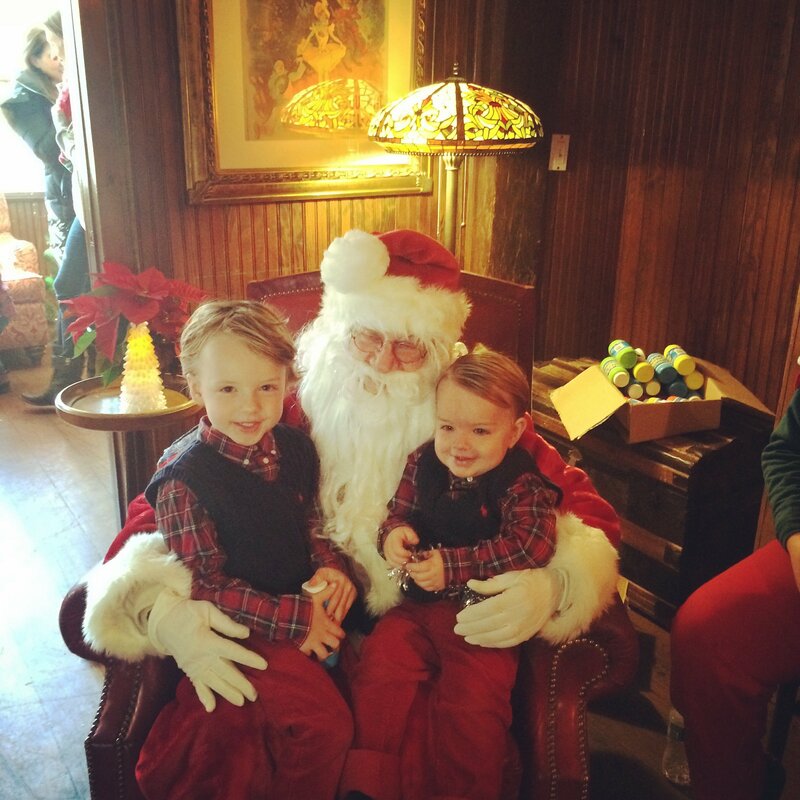 There are great plays at the theaters, interesting art exhibitions, beautiful nature trails and all the Holiday seasons are magical out here- especially Halloween and Christmas are worth a trip to the Hamptons for. I love Christmas shopping in the Hamptons, its relaxing and all the towns are decorated beautifully and we are so lucky to have great shops here such as Stephanie von Watzdorf´s store Figue in East Hampton, where she sells her stylish bohemian chic clothing line and Aerin Lauder´s store in South Hampton Aerin is a great place to find something special. She has such sense for style and her store is full of her stylish housewares and accessories that makes the perfect Christmas gifts. There are so many lovely local farm stands out here that has been in the same families for generations and it feels so wonderful to help and support them so they can stay open because that is what makes it pretty unique to live out here year round. You can go and pick the apples yourself, stop by a dairy farm and get some local cheese and then stop by the local vineyard and buy a bottle of wine for dinner. To me that is a luxury not to be taken for granted. Some of my favorite farm stands are: Mecox Bay Dairy in Bridgehampton, a dairy farm that has been in the same family since 1875 and famous for their aged cheddar cheese. Amber Waves Farm in Amagansett which is founded by two cool girls, Catherine and Amanda whom have set a new trend for women to become farmers. Another favorite is Halsey´s Farm Stand Green Thumb next door to the Tracy Anderson Water Mill studio, a farm that has been in the same family since 1644 who produce great organic veggies. 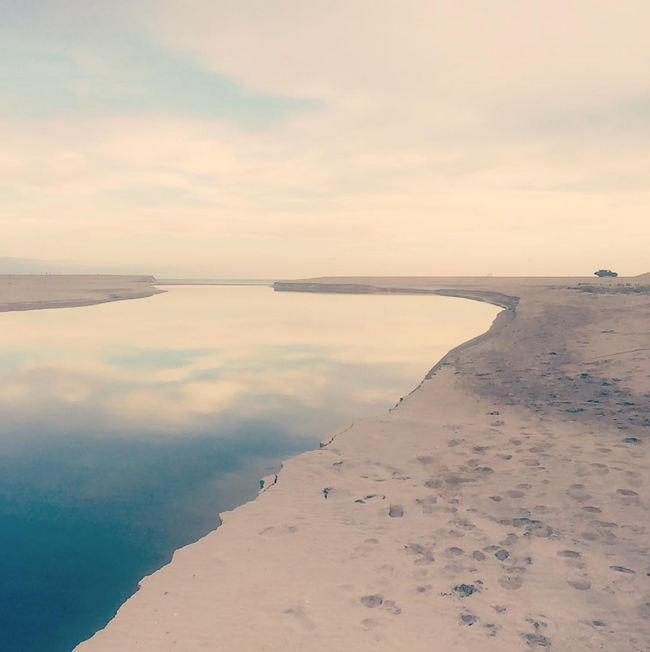 To watch the seals play in the ocean by Montauk Lighthouse in the winter and spring season is pretty amazing and to walk the walking dunes in Amagansett is unique too. To sit on Long Beach in Sag Harbor or any of the ocean beaches during an autumn and winter sunset and watch the sky turn pink and purple is one of the most breathtaking and reviving experiences one can have here. No wonder so many artists choose to live here year round. Come spring and all the gardens start to bloom and all the places come alive, that is wonderful too. WHERE SHOULD WE STAY DURING WHAT SEASONS IN THE HAMPTONS? For summer Sunset Beach on Shelter Island, this is the place to go if you dont have time to go to Europe but you want to feel like being in St Tropez. Rooms are not that spacious but the view covers up for it and the restaurant is great! For autumn winter and spring I love the Gurneys Resort in Montauk, there is a great indoor pool with view of the ocean, they have an ice skating rink during winter season and the restaurant offers great views of the ocean in all seasons. 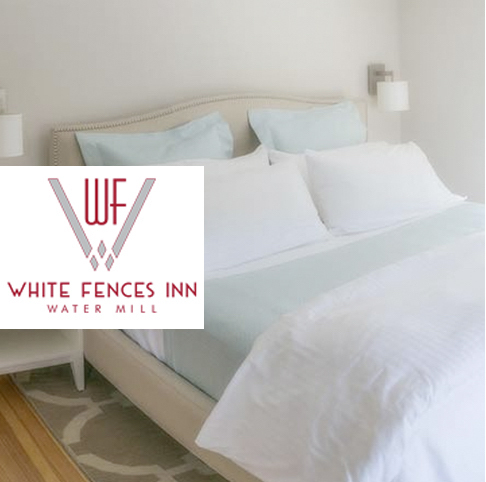 I love the The Inn at The Windmill in Amagansett with its spacious stylish suites and cottages and the exclusive Baker House in East Hampton for its great spa, heated outdoor pool and the best brunch. The Maidstone Hotel in East Hampton for its Scandinavian touch and Swedish meatballs. The Topping Rose House in Bridgehampton for its comfortable rooms and great restaurant and The White Fences Inn in Water Mill for its privacy and one of the very best breakfasts out here and last but not least the iconic American Hotel in Sag Harbor with its cozy rooms and fireplaces in the restaurant to keep you warm on a cold day. WHERE SHOULD WE DINE IN THE HAMPTONS? 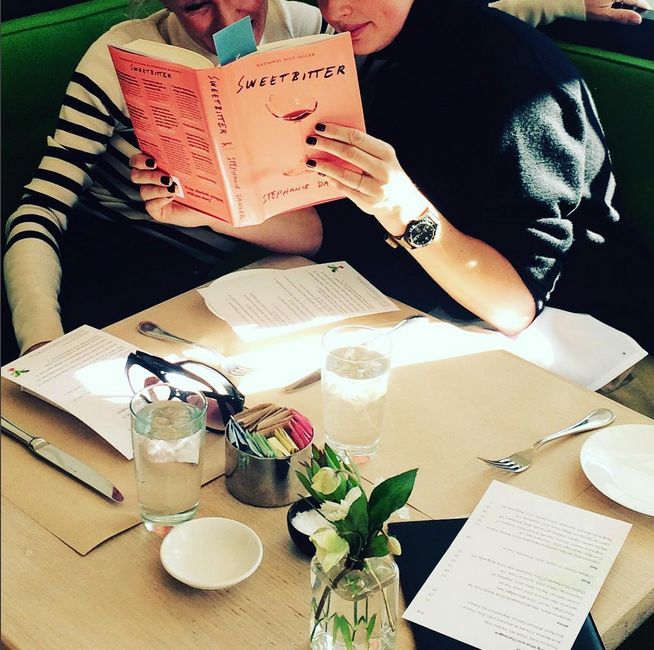 For the scene and people watching – Nik & Toni´s or The Palm in East Hampton. 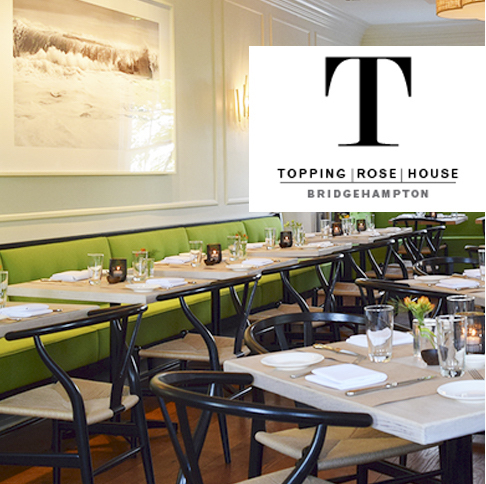 For elegance and farm to table – Jean Georges at Topping Rose House in BridgeHampton. 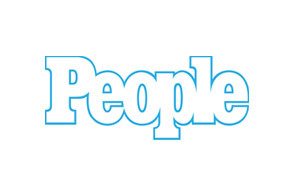 For best Italian –Dopo La Spiaggia in Sag Harbor. I love to sit in the bar and watch the sunset settle over the harbor. For good old times-The restaurant at The American Hotel in Sag Harbor. 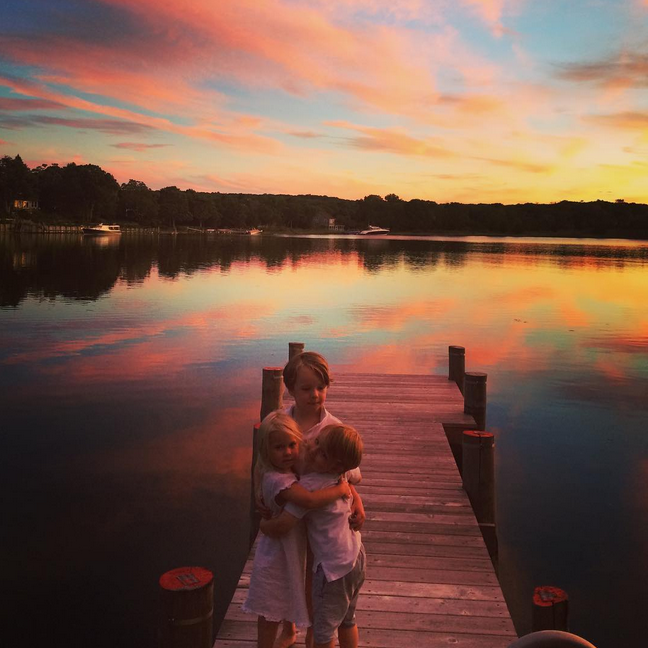 What I really love to do is a sunset picnic on Main Beach or Georgica Beach in East Hampton with take-away from Round Swamp Farm –a family owned farm stand that for generations has made the very best take-away in the Hamptons. One of my absolute favorite places to experience in the summer is the LongHouse Reserve in East Hampton. It is a place of tranquility and peace and it is one of the most visited gardens in the world. A sixteen acre sculpture and art installation garden featuring pieces from Yoko Ono to De kooning. There are really no words to fully describe this place, it is a must visit. During summer season they arrange a few sunset tours of the garden where you also get to visit the stunning private home of the founder Jack Larsen. They stay open most of the autumn (weekends only). I also love Madoo Garden in Bridgehampton. It is the former private home of Robert Dash, a noted painter and writer. Madoo is a magical garden with many secrets paths and during summer season the local library reads for children in the garden every Monday which is so lovely. I love Wölffer Estate Vineyard in Sagaponack and this is a place to visit all year round. It is a beautiful vineyard located in the heart of Sagaponack and they do so many lovely events throughout the years such as The Harvest Festival in October and the Lightning of the Vines in December where they have 15000 lights illuminate the winter vineyard. Its so beautiful and romantic. During summer they have jazz concerts while the sun sets over the vineyard that brings the locals and the summer residents together. I also love to explore CMEE – The Children´s Museum of the East End with my sons. It is a big indoor and outdoor dream playground for children where they can use all their senses and skills and have fun. Georgica Beach in East Hampton. There is a beautiful hidden path off the West End Road from where you can walk down to Georgica Pond where the water is calm and on the other side of the road there is a hidden path to a bench high up above the sea from where you can quietly watch the waves. Whether I go there on an early summer morning or in the winter, the silence and view takes my breath away. YOU ARE THE GO TO TRAVEL GURU ESPECIALLY TRAVELING WITH KIDS. WHAT ARE SOME OF THE BENEFITS YOU FIND FROM BRINGING YOUR KIDS ALONG ON A JOURNEY? WHERE CAN WE FIND MORE OF YOUR TIPS ABOUT TRAVEL? To bring your children along when traveling opens their eyes and souls to new cultures and tastes that they will otherwise not experience. I feel it is our responsibility as parents to help our children to stay curious to new places and cultures. They become world citizens and have a greater openness the more they travel. My sons are 3 & 5 years old and they speak four languages fluent which is one of the many benefits from traveling and this allows them to connect with other cultures much easier. They have been to remote simple places and they have stayed at some of the best hotels and resorts in the wold and they feel comfortable both places because they are so used to change of scenery. Another benefit is that I get to dress up my sons which I love. They know that they cant wear a batman outfit when checking in to a hotel or boarding a flight or going to a fine dining restaurants. They have come to appreciate dressing up because they know it means new adventures and often many compliments on the way. I am doing a series of interviews with some of the oldest doormen in the New York from the old classic hotels and its amazing to see the eyes of my sons when they hear what the doorman have to share with them. Did you know that Liza Minnelli grew up at The Plaza Hotel and that Eloise –based on Kay Thompson’s Children’s books is inspired by Liza´s childhood at the Plaza? Another benefit from all the traveling is to discover all the fun services that are out there for families to enjoy, such as sky nannies to help on board a flight, custom made designer strollers for luxury hotels for their guests to use, cooking classes with famous chefs and much more. It is so interesting to watch and experience children visiting a new place for the first time and it doesn’t always have to mean you need to fly across the world, a hotel night in your own city or somewhere close can be just as fun for them as a place on the other side of the planet. As the famous Danish Children´s book author Hans Christian Anderson so correctly said “ To Travel is to Live”. 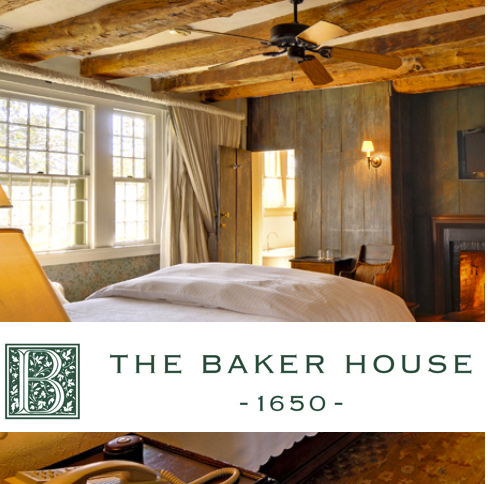 The Baker House is a luxury hotel with seven spacious rooms and a great spa and famous for their brunch. The hotel is located a short stroll from beaches and village of East Hampton. 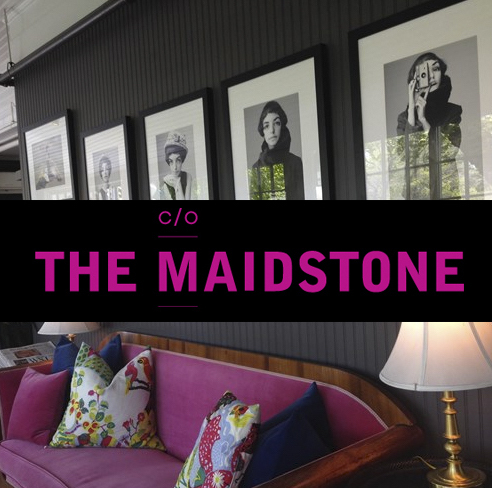 The Maidstone Hotel offers 22 rooms, all in different forms and shapes filled with the best of Scandinaivan furniture and culture. The owners private art collection can be enjoyed throughout the hotel. The hotel is located a short walk from beaches and village of East Hampton. Dr. Ramsey is on a mission to reestablish the natural nutrients that make our entire beings happy and functioning at their absolute best. A psychiatrist, assistant clinical professor at Columbia University College of Physicians and Surgeons, author and farmer, he advocates for real mental wellness with real foods, not diets, prescriptions or pills. Through his TEDx talks, writing for The New York Times and The Wall Street Journal, and his three books: The Happiness Diet: A Nutritional Prescription for a Sharp Brain, Balanced Mood and Lean, Energized Body, his recent bestseller 50 Shades of Kale and his newest release Eat Complete: The 21 Nutrients that Fuel Brain Power, Boost Weight Loss and Transform Your Health, he is making big waves in the world of holistic and nutritional psychiatry that are truly bringing us back to our roots. Dr. Ramsey’s work resonated with me, not only because he voices the same things I believe in (and feel that I alone have been screaming for years without being truly heard!) but also because we are fellow Hoosiers who both grew up with parents that were of the organic mindset. My Mom never allowed pop or bags of cool ranch Doritos in our home. She baked our own bread and had our chickens running super free. It now seems obvious why he and I both feel allergic to the denatured world we are living in and know the importance of physical activity and getting our nourishment back in touch with nature to save our collective brains and bodies. I stand wholly with Dr. Ramsey in the fight for the right to organic ingredients and natural foods. Dr. Ramsey explains that as a psychologist, the staggering numbers of young women suffering from depression alone is reason enough for us to understand that our brain has to be treated with natural nourishment not processed foods. Dr. Ramsey’s realization that the cure to his patient’s psychological battles is not through unearthing troubles of their past or writing a prescription, but instead, examining and altering the nutrients they are feeding themselves, is a brilliant one. He tells a story on one of his inspiring TED talks about a woman (the type that I see often in my own practice) juice cleansing, afraid of fat, meat, eggs, etc. all for “health” reasons who doesn’t realize that she is missing essential nutrients for her healthiest self! There isn’t enough truth out there to counteract the gimmicky quick-fixes that aren’t healthful or helpful to our bodies and minds. We have to take a critical stance and be educated by the remarkable minds like Dr. Ramsey who aren’t out to sell you a juice cleanse or a diet pill because they are the ones who are actually FOR you and FOR your health. Dr. Ramsey is a psychiatrist, author, and farmer. He is one of psychiatry’s leading proponents of using dietary change to help balance moods, sharpen brain function and improve mental health. He is an assistant clinical professor of psychiatry at Columbia University College of Physicians and Surgeons and in active clinical practice in New York City where his work focuses on the clinical treatment of depression and anxiety. 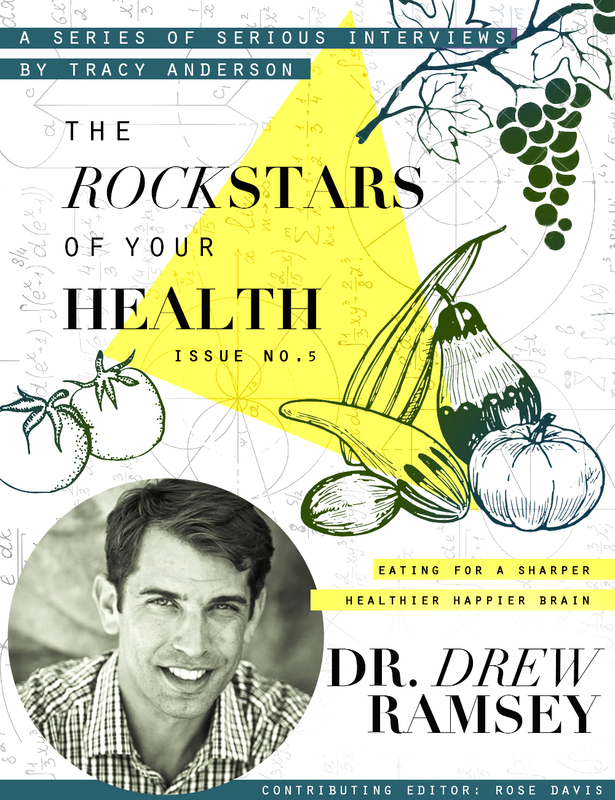 Using the latest brain science and nutritional research, modern treatments, and an array of delicious food he aims to help people live their happiest, healthiest lives. That’s such a great question. The lure of a quick fix is a signal that someone is out of balance. Being in a growth mindset as a person helps you continue to learn as you change, and your tastes change over time. A common roadblock I see in a lot of people we work with in my clinic is lack of a proper assessment. 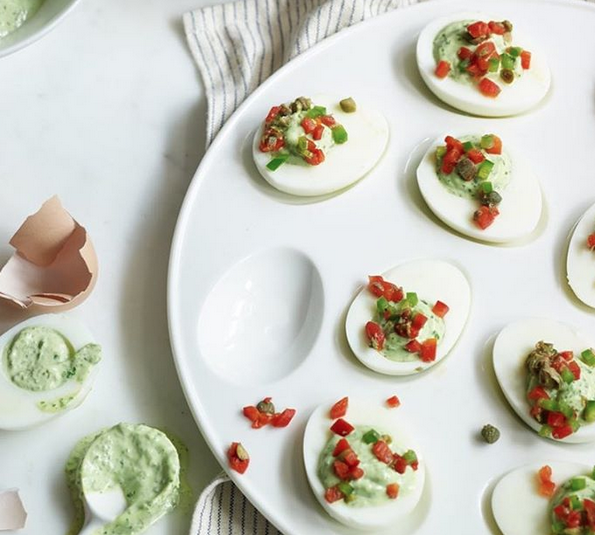 People know something needs to change and instead of being specific about their challenges and making a solid plan, they fall prey to quick fixes or trendy diets. And then there is the massive roadblock of misinformation. Many people still think fat is bad, or that eating well is very expensive and all this creates a block for people because getting started feels like such a big undertaking, it is not. Eating well and living a healthy lifestyle are super simple. That is one of the big messages I hope people get from reading EAT COMPLETE. I have the Simple Food Assessment that I use in my practice in the book and on my website to help people get started. WHAT ARE SOME OF THE WORST/BEST FOODS FOR YOUR BRAIN AND WHY? HOW DO THEY AFFECT THE BRAIN, OUR BODY AND OUR MOOD? There is now a lot of science available about how food impacts brain health and it tells a pretty simple message: Fake food increases the risk of depression and memory loss. Real foods like tomatoes, lentils, eggs, and seafood are the best foods for the brains. We really try to emphasize food categories, and we want people eating a rainbow of colors derived from crunchy plant sources. These should be the foundation of your diet. On top of that plant base, most folks need to up their seafood game and get serious about changing their relationship with meat. I prescribe a lot of oysters and mussels as they have so much vitamin B12, zinc, and the long-chained omega-3 fats that are incredible for brain health. Another critical intervention is improving meat quality, and for most people replacing some meat with plant proteins. The worst foods for overall happiness and the brain are highly processed foods, items with long ingredient lists and often artificial ingredients. This stuff was made for the shelf, not for your health. I also dislike the many items that are supposed to be healthy but are just a giant dose of simple sugars and artificial ingredients: fruit smoothies, low-fat flavored yogurt, gluten-free junk food, protein powders, juices, “low-fat” baked goods. 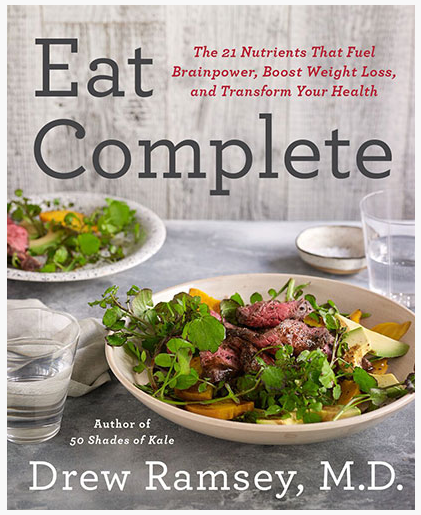 IN YOUR BOOK, “EAT COMPLETE” YOU DESCRIBE THE IMPORTANT NUTRIENTS THAT ARE NEEDED FOR A HEALTHY BRAIN. WHAT ARE THE ONES THAT PEOPLE ARE MOST COMMONLY MISSING IN THEIR DIET? ARE THERE ONES THAT ARE HARDER TO INTEGRATE INTO OUR DIETS THAT WE SHOULD BE EXTRA CONSCIOUS ABOUT INCLUDING? The diet of most Americans is missing the most important nutrients for the brain, nutrients like omega-3 fats, B12, and zinc. While researching Eat Complete, I was really shocked at how high the numbers are in terms of percentage of people not meeting the recommended daily allowance (RDA). So what are the nutrients almost everyone needs more of? Well, magnesium and potassium are two that stand out to me because they illustrate why plants are so good for us. These two minerals are needed every time a brain cell fires. Also at the top of the list of nutrients needed for improved moods are the long-chained omega-3 fats that you mostly find in seafood. The goal of Eat Complete is to get your nutrients from food, just like we always have. MANY PEOPLE FEEL A CHANGE IN DIET WON’T PRODUCE IMMEDIATE RESULTS, WHAT DO YOU RECOMMEND TO STAY MOTIVATED FOR THE LONG-TERM? Ok I disagree with this! And everyone reading can test this out. Eat junk today then write down how you feel at the end of the day. What has your day been like in terms of your energy, mood, and focus. Then I want you to eat a balanced, focused meal plan and ask yourself the same questions. 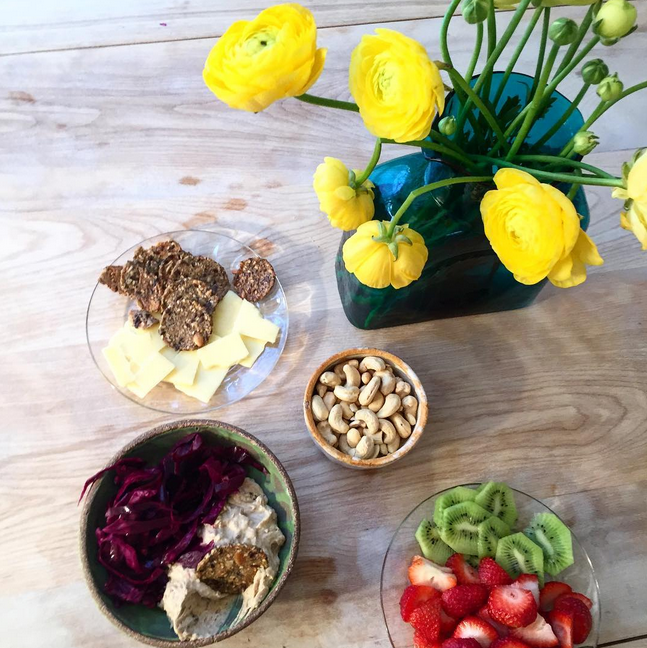 Eating well is not about a set of rigid rules. Eating complete is an act of self-care and self-love. 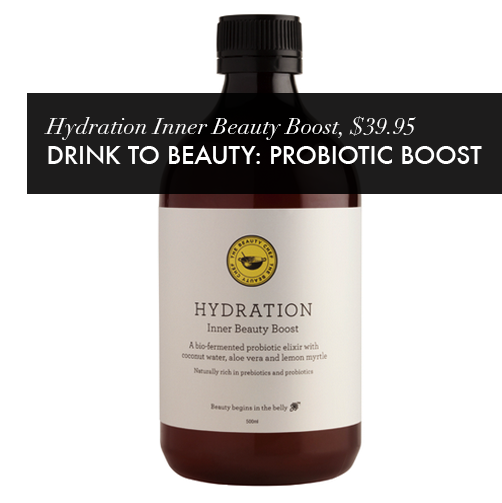 When we nourish ourselves we get immediate results. To stay committed over the long-term we need to see our lives as a set of small choices, mostly under our control. 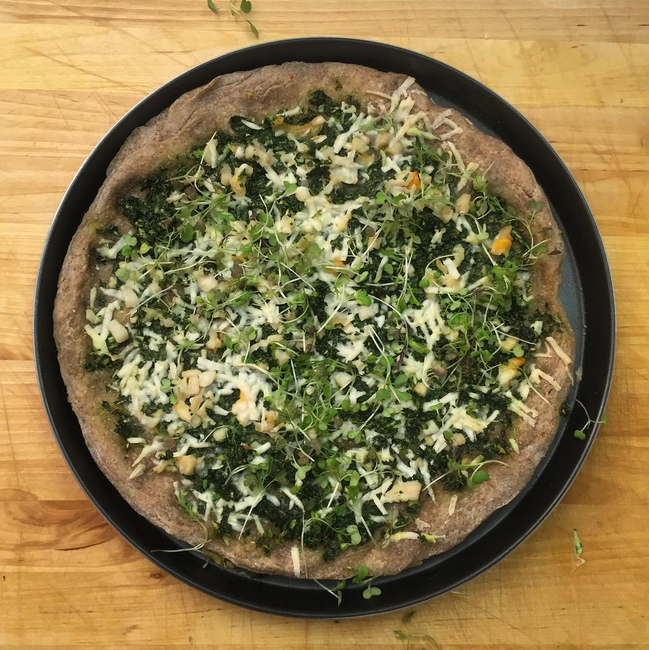 There is a section in Eat Complete on mindful eating with some ideas and exercises that help folks shift from working towards goals in the future to being present at the table. 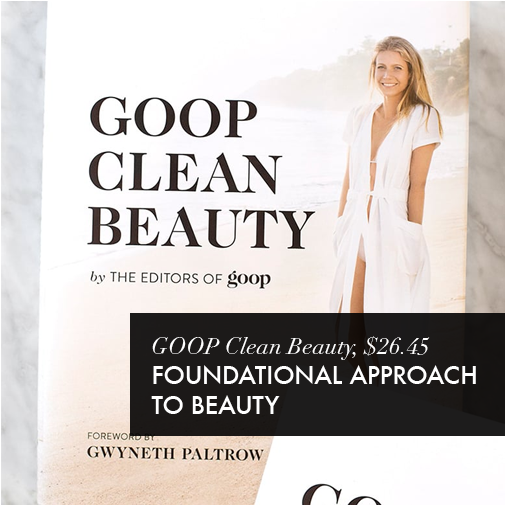 SINCE YOU CAN’T SEPARATE YOUR PHYSICAL SELF FROM YOUR EMOTIONAL SELF FROM YOUR INTELLECTUAL SELF HOW CAN YOU GIVE US A FEW QUICK SOUNDBITES WE CAN HAVE IN OUR EAR WHEN IT COMES TO MANAGING THE INNER CONVERSATIONS THAT MAKE US WANT TO REACH FOR THE BAD FOODS OVER THE HIGHLY NUTRITIOUS? HOW DO YOU ADVISE OVERCOMING JUST GOING FOR THESE QUICK, CHEAP, (AND ALMOST ADDICTING!) OPTIONS THAT OUR SOCIETY HAS MADE SO EASILY AVAILABLE? What is quicker than an organic apple or more satisfying that a handful of raw cashews and dark chocolate? Nobody wants to describe themselves as cheap and easy, so why would we want that for our food? I hate how “healthy” becomes synonymous with “difficult” or “expensive” because this is not true. I advise people to keep the junk out of the house so that unhealthy foods that they are having a hard time with are not within reach. Then my first line of defense is to make a list of “Brain Food Swaps”, meaning finding the better alternative for the stuff you crave. For example, I love mashed potatoes. To get more nutrients, I mash small potatoes and keep the skins on because that is where many of the nutrients are, or I swap for a cauli mash and load it up with turmeric, scallions, and a little cheese. Or bake purple yams and mash them. They are incredible, and much more satiating than a big white spud. I also try to stay out of the center aisles of the grocery store and do most of my shopping at the local Farmer’s Market. It is fun for me as a farm boy to live in New York City and have the bounty of so many farmers just a block from my house. CAN YOU REVERSE DAMAGE THAT YOU HAVE PREVIOUSLY CAUSED WITH BAD FOOD CHOICES BY BECOMING SMARTER ABOUT YOUR DIETARY INTAKE? YES! For most people this is the answer. Studies have shown that the impairments in brain function that come with obesity can be reversed in 6 weeks after weight loss. I worry it can be de-motivating to think that the damage is done, or that it can’t be reversed. Changing your food CAN transform your health, and especially your mental health. DO WE STILL NEED TO BE CONSCIOUS OF EATING “EVERYTHING IN MODERATION” EVEN WHEN EATING THESE NECESSARY NUTRIENTS? CAN WE EVER GET TOO MUCH? 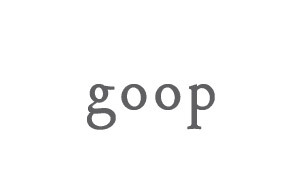 I am no longer a fan of this phrase. It is misleading. I don’t want people drinking “moderate amounts” of soda or juice. I don’t think moderate amounts of bologna or fried chicken or white chocolate is a good idea. And I think moderate amounts of greens and other rainbow vegetables are not enough. America’s health is a five alarm fire right now, so I am not a big fan of moderate interventions. But to your question, you can’t get too many nutrients eating a diet of whole foods. However, there are few exceptions, for example Brazil nuts have very high concentrations of selenium and eating lots of them can cause selenium toxicity. There are also some foods that interact with medications, such as leafy greens and the blood thinner Warfarin. (People should check with their physician if they have specific concerns.) One of the main reasons I advocate getting all your nutrients from food is that it is simply safer than supplements. DO YOU RECOMMEND THAT PEOPLE TAKE ANY SUPPLEMENTS? IF SO, WHAT IS THE GENERAL SPECTRUM YOU RECOMMEND AS WELL AS ANY BRANDS THAT YOU FEEL ARE TRULY OPTIMIZED? For specific deficiencies and in some clinical situations I will use a few supplements such as fish oil, vitamin D, and St John’s Wort. But overall people are taking way too many supplements! It is crazy to me that folks are upset about Big Pharma but have no issue with Big Supplement. I see so many people taking hundreds of dollars of supplements a month with no effect and no evidence they work. In my first book The Happiness Diet, I made a list of 100 reasons not to take supplements for basic nutrition. I was surprised how easy it was to make the list. There are a lot of opinions about supplements, but I recommend people look at the FDA recalls for a sense of the dangers. 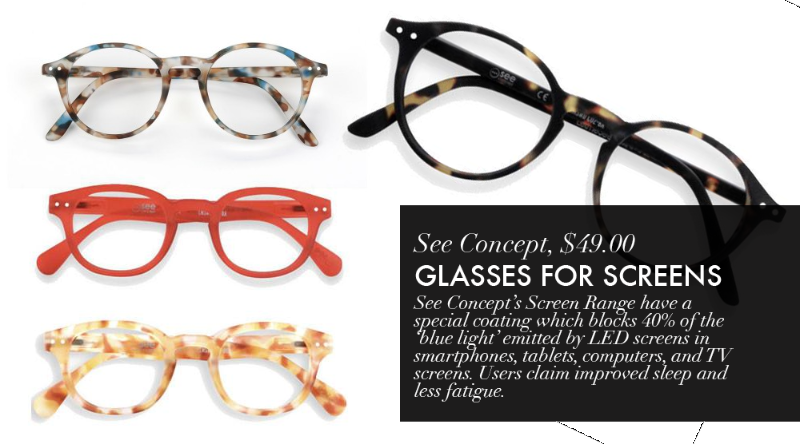 The best source for accurate information of brands is Consumer Labs. I don’t recommend any specific brands, but I do recommend this information source so people can make informed decisions. I TOO AM A HOOSIER AND VERY PROUD OF IT. HOWEVER, LIKE MOST OF THE FARMING IN THE WORLD, I GREW UP NEXT TO A CORN FIELD THAT WAS SPRAYED WITH PESTICIDES. HOW IMPORTANT DO YOU BELIEVE IT IS TO BUY ORGANIC? Tracy, you are an example of Hoosier greatness! I am writing this from our family’s organic farm in Southern Indiana. We have been stewards of this land for 35 years and have never used any pesticides. The amount of life here and the diversity of species has really struck me this summer. Every year we take a “farm sabbatical” and spend the summer growing our food. Currently, America’s food system built of monoculture crops require a lot of chemicals to grow, but the food industry is very responsive and aware of the incredible growing demand for organic food. Organic farming is hard, but it is the right way to grow our food. Does everything you eat need to be organic? I’ve met a lot of people for whom this was not practical. Some produce matters more than others, I use the Environmental Working Group’s list of “Dirty Dozen”. Along with organic, I also am excited to see more grass-fed meat and dairy products being offered. The bottom line is that we don’t want to eat toxins in our food, and currently we do. Focusing on in-season organic produce is a great way to get more plants in your diet safely and economically.